The use of snus (also referred to as Scandinavian or Swedish moist smokeless tobacco), which is common in Sweden and increasing elsewhere, is receiving increasing attention since considered a tobacco smoke “potential reduction exposure product”. Snus delivers a high dose of nicotine with possible hemodynamic effects, but its impact on cardiovascular morbidity and mortality is uncertain. The aim of this study was to investigate whether snus use is associated with risk of and survival after acute myocardial infarction (AMI). Data from eight prospective cohort studies set in Sweden was pooled and reanalysed. The relative risk of first time AMI and 28-day case-fatality was calculated for 130,361 men who never smoked. During 2,262,333 person-years of follow-up, 3,390 incident events of AMI were identified. Current snus use was not associated with risk of AMI (pooled multivariable hazard ratio 1.04, 95 % confidence interval 0.93 to 1.17). 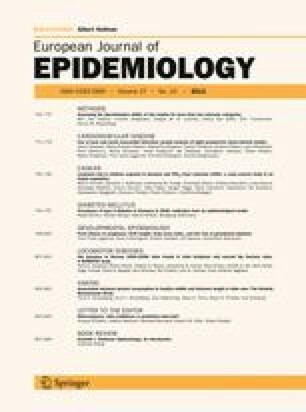 The short-term case fatality rate appeared increased in snus users (odds ratio 1.28, 95 % confidence interval 0.99 to 1.68). This study does not support any association between use of snus and development of AMI. Hence, toxic components other than nicotine appear implicated in the pathophysiology of smoking related ischemic heart disease. Case fatality after AMI is seemingly increased among snus users, but this relationship may be due to confounding by socioeconomic or life style factors. We thank Kontie Moussa, Eleonor Fransson, Annika Gustavsson and Tomas Andersson for their contributions to this paper. This study was funded by grants from the Stockholm County Council, the Swedish Research Council (grant n o. 2007-3185), National Institute of Public Health (grant no. 2008/188), and the Swedish Council for Working Life and Social Research (grant no. 2010-0546). The Northern Sweden MONICA study was supported by grants from Norrbotten and Västerbotten County Councils, the Swedish Research Council, the Joint Committee of Northern Sweden Health Care Region (Visare Norr), the Heart and Chest Foundation, the Stroke fund, King Gustaf V’s and Queen Victoria’s Foundation, the Vårdal Foundation and the Social Sciences Research Council. The Wolf study was supported by the Swedish Council for Working Life and Social Research. Norberg M, Wall S, Boman K, Weinehall L. The vasterbotten intervention programme: background, design and implications. Glob Health Action. 2010; 3:4643. doi: 10.3402/gha.v3i0.4643.